Toyota, which leads FCV sales globally with the Mirai, has only shipped about 4,300 since its launch in late 2014. 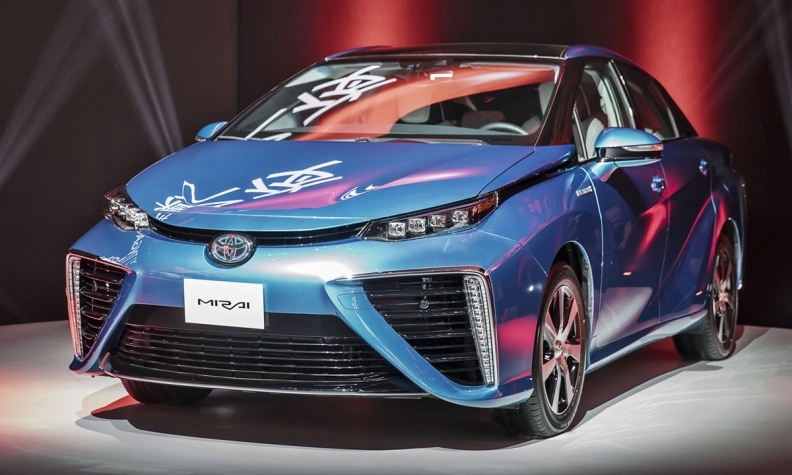 TOKYO -- Toyota Motor Corp., which has made a big bet on hydrogen-powered cars, is looking more isolated as industry rivals double down on plug-in electric vehicles as the dominant technology in the emerging post-fossil fuel era. Three years ago, Toyota President Akio Toyoda, grandson of company founder Kiichiro Toyoda, unveiled the Mirai, a four-door family sedan powered by hydrogen tanks and fuel-cell technology that emits nothing but heat and water -- and none of the gases that contribute to global warming. However sales of the $57,500 sedan -- available in Japan, California, and parts of Europe -- have yet to break the 5,000 mark, compared to some 300,000 of Nissan Motor Co.’s battery-electric Leaf. Toyota isn’t the only player in fuel-cell vehicle development. However, even hydrogen-car backers such as Honda Motor Co., Hyundai Motor Co. and Volkswagen AG’s Audi have refocused their zero-emissions car strategies on EVs. Investment in hydrogen power stations has been glacial and technology advances have lowered the cost of batteries and extended driving ranges. China, the world’s biggest car market, nearly doubled the number of charging points last year to 215,000, while the number of hydrogen stations was all of five. It plans to introduce a cap-and-trade emissions policy from 2019, and has joined a growing list of countries seeking deadlines to phase out fossil fuel-powered vehicles. Tesla Inc. this month unveiled a new Roadster that it claims will have a 620-mile driving range, twice that of Toyota’s Mirai. The electric carmaker’s CEO, Elon Musk, has long disparaged fuel cells because of the cost and difficulty of creating, storing and transporting hydrogen. By contrast, the relative simplicity of EV powertrains has helped open the door to a host of new entrants, including vacuum-cleaner billionaire James Dyson. Bloomberg New Energy Finance sees electric cars reaching price parity with their gasoline-burning cousins as early as 2025, following a 73 percent plunge in lithium-ion battery prices between 2010 and 2016. As such, fuel-cell technology is increasingly being put on the back burner. Honda CEO Takahiro Hachigo said last month he thinks EVs will proliferate faster in the near term, and Hyundai Executive Vice President Lee Kwang-guk said in August that EVs will now be the “mainstay” of the Korean automaker’s eco-car lineup. Fuel cells were barely a footnote when VW CEO Matthias Mueller announced the group’s aggressive electrification strategy in September. By contrast, Toyota says its fervor for the technology it began developing in the early 1990s remains undiminished. Fuel-cell and battery-electric vehicles must be developed “at the same speed” because different parts of the world will favor different energy sources based on their specific needs, Executive Vice President Didier Leroy said in an interview at last month’s Tokyo Motor Show, where Toyota was the only Japanese automaker to display hydrogen-powered vehicles. California is currently the main market for fuel-cell vehicles outside Japan, but has just 30 hydrogen stations. Efforts by Toyota and its partners to set up infrastructure on America’s East Coast have been plagued by delays. By contrast, BNEF counted more than 44,000 charging points nationwide in 2016. Japan has 91 hydrogen stations and is aiming for 160 by 2020 and 320 by 2025. But that’s against more than 28,000 charging points at the end of last year, according to BNEF, whose analysts forecast the high costs and strict regulations governing hydrogen stations will mean the government can only meet 75 percent of its 2020 goal, and an even smaller proportion of its 2025 target. The gap is widening even as Toyota forges partnerships aimed at promoting fuel cells. One such global entity established at the start of this year, the Hydrogen Council, said this month that the lightest element could supply a fifth of worldwide energy needs by 2025. Fuel-cell proponents face a chicken-and-egg dilemma: increased infrastructure requires additional vehicles to support it, and vice versa. Toyota, which leads FCV sales globally with the Mirai, has only shipped about 4,300 since its launch in late 2014. By contrast, Nissan has sold about 300,000 of the Leaf since 2010 and Tesla has delivered more than 250,000 electric vehicles since the first Roadster rolled out in 2008. The figures at other FCV makers are even starker: Honda has shipped fewer than 700 of the Clarity Fuel Cell since its debut last year, while Hyundai has moved about 900 of its Tucson Fuel Cell since 2013. Toyota has set a lofty goal of selling 30,000 FCVs annually by around 2020. Achieving that will need not just more infrastructure, but improvements to the Mirai itself, according to chief engineer Yoshikazu Tanaka. The list he gave echoed what Musk has done with his second-generation Roadster, which on top of a 620-mile range can go 0-60 miles per hour in 1.9 seconds. Toyota Chairman Takeshi Uchiyamada told Der Spiegel in an interview this month that Tesla is not the Japanese company’s “role model,” and that battery-electric vehicles with long ranges are both heavy and too expensive to be mass produced. The new Roadster will be available from 2020 with a base price of $200,000. “Such cars do not fit in our program,” Uchiyamada said. Toyota’s priority for now has been to step up development of hydrogen-powered commercial vehicles, which the company sees as encouraging new filling stations to service them because their largely predetermined routes guarantee revenue. Toyota sold a pair of fuel-cell buses to the Tokyo government at the start of this year, and plans to have about 100 on the road by 2020. It’s also developing a delivery truck for trials with convenience store 7-Eleven Japan from 2019. In California, it’s testing a semi-trailer truck.